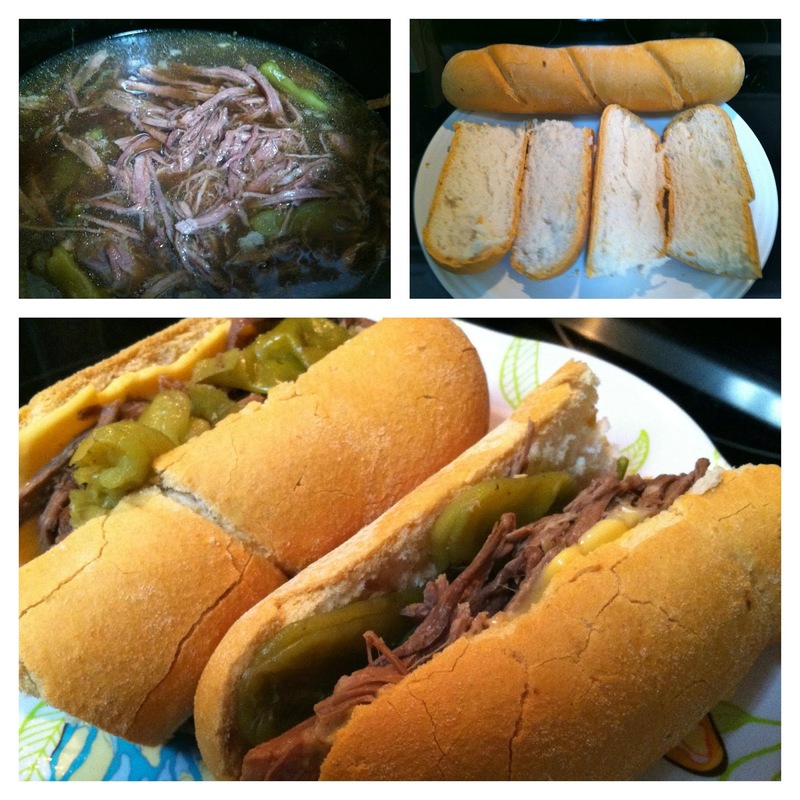 Italian Beef is something my mom made and now I make. The original recipe called for a bottle of beer and beef broth or bouillon, and of course, the best part, a hard crunchy outside, but soft on the inside french-like bun. Luckily, I've found away around the gluten ingredients so we can still enjoy this comfort food on these very, very cold days. Finding the right gluten-free french bread was a challenge, until I found Udi's dinner rolls, which I used the last time, but THEN, I found their FRENCH BAGUETTES and this just made it 10 times better! NOTE: Do not pour peperoncinis - fork out about 8-10 peperoncinis - these pack some HEAT, so start out with 8-10 and if you like it with more heat, add more peperoncinis. Add 1 tsp. of garlic powder or minced garlic at this time as well. Cover and cook on LOW for 6-7 hrs. - until beef easily falls apart with fork. After 6 hours, the roast should fall apart when you use a fork to test the tenderness, if not, it needs more cook time. At this time, I taste the broth as well and add salt, pepper and more garlic as needed. Since we aren't big on heat, I don't add any more peperoncini juice from the jar, but if you want more heat, go for it. Keeping it kid friendly, so we avoid the heat. My daughter loves eating the roast by itself. Jack, we're still working on him trying it...remember, he's our picky eater. If your roast has a lot of fat, discard the fat. My mom would take the roast out of the slow cooker and shred and remove the fat that way, but that's more time and I really didn't have that much fat on this roast, so I skipped that extra step. Follow directions on Udi's French Baguettes or Udi's Dinner rolls for smaller sandwiches. package - only 10-15 minutes in 400 degree oven. The package contains 2 loaves, which will make 4 sandwiches. Put cheese on your french bread. Use tongs for the shredded beef and place on top of cheese. I then spoon some of au jus onto the sandwich. More au jus? Pour some in a small bowl and dip away. For left-overs today, my daughter and I will have the Italian Beef over rice - it's delish this way as well!